The LA Times on the new Batman movie promotion. I know that over the last few years my hearing has decreased a bit. Either that or the entire planet is mumbling. But I'm married to a drummer, so I always felt as if my hearing was pretty good, comparatively speaking. Then I found this website. It allows you to test and download ultrasonic ringtones. Adolescents and children hear a lot better than people over thirty, at least a lot of them do. That means they can hear sounds in higher frequencies. Some stores are using ultrasonic sounds to keep teenagers out. And apparently, some teenagers are using ultrasonic ringtones so that they can hear their phones ring but the adults in their lives--teachers, parents--can't. 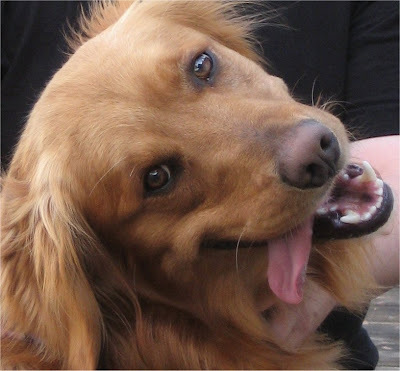 The website has a series of tones you can test, starting at one that almost everybody can hear, and moving through tones that lots of people can hear, and then on up the scale to stuff the dog can hear. I can hear 8, 10, and 12 kHz just fine thank you. But when I hit 14.4 kHz, for all I knew the file wasn't working. On repeated tries I've found that sometimes I might hear something, but it might just be that I know other people are hearing it. One of my office mates, Steve, had his teenaged daughter at the office. 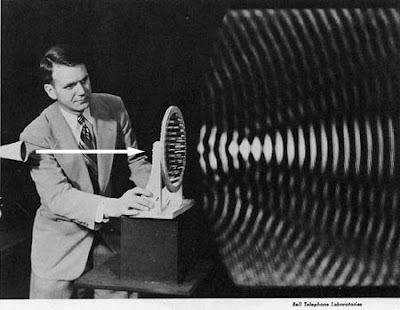 She could hear all the way up to 18.8 kHz or 19.9 kHz. I find it all very strange. I can't wait to try it on the dog. I work in LA, so Bob has never actually met any of the people I work with. I fly out to California every week now. There's not a lot of reason for people I work with to come to Austin. Except, maybe, the SXSW Interactive conference. So I had to cook. 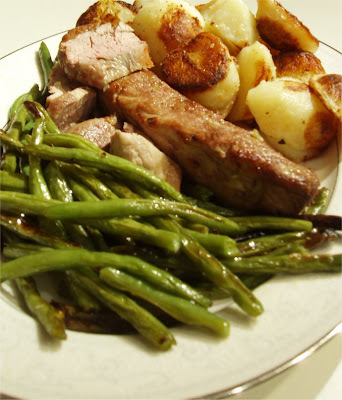 Pork tenderloin in a garlic honey glaze, potatoes roasted in duck fat, and roasted green beans. 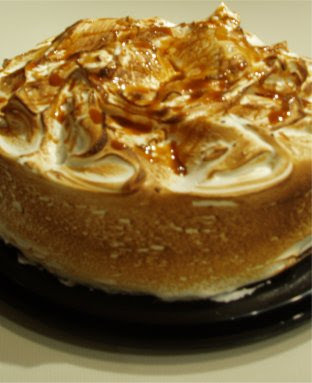 For desert, a Tres Leches cake, a Mexican cake that is soaked in condensed milk, evaporated milk, and whole milk or cream. It sounds like a soggy mess, but it's more like cake that comes pre-ice creamed. But then I get an email from Steve. His plane is delayed. He's not getting in until too late to come see us. I'm sorry Steve. So is Bob (although Bob is grateful because I don't cook nearly as much as I used to and he got a fairly good meal out of the deal.) Here's hoping you get here sometime. I hope to cook for you when you do. On Saturday, we were tossing the ball and Hudson managed to bite his tongue. We had a house full of guests. The band was jamming. A couple of us non-musicians were supposed to go get bbq. So we waited while Hudson wanted to continue to play. After twenty minutes he was still bleeding. It wasn't excessive, and frankly, he really didn't care, but it was, you know, gross. Having Hudson is like having an adolescent jock around the house, ever so often you're going to have to make a trip to the ER. So I put an old sheet in the back of the Subaru and my friend Linda and I took off for the doggy ER. Doggy downers did not actually have much visible effect on Hudson, but after everyone had left, I coaxed him up onto the ottoman and chair where I was sitting. He's a little worried that if he gets up there he'll get in trouble, but he is always willing to be convinced. Usually he plops down and then plays, 'I'm gonna bite your hand.' He's soft mouthed so 'I'm gonna bite your hand' is mostly a way to interact. But Saturday night he got on that comfy chair sprawled next to me and zonked. It was charming. Someday he's going to be a big lap dog. But not for awhile. I suspect there might be a trip or two more to the doggy ER before we get to the stage where he can lie still and have his ears scratched. At least, not without doggy downers. I'm not in a hurry or anything. But it was sweet. It is amazing how a simple edit can take a banal comic like Garfield and make it something quite moving and fascinating.